We went to the celebration event for this remarkable project. 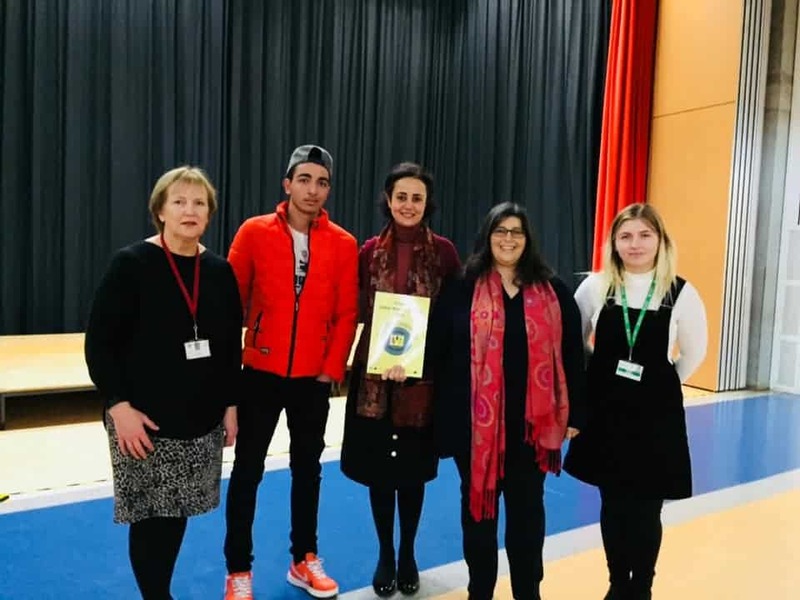 This year two of the RA-C team and Zak, a 16 year-old from Syria have spent an entire morning or afternoon at 12 schools across the Tendring area. We have some fun activities, including writing in Arabic, and some reflective ones where students list what they would take with them if they had 10 minutes to fill a backpack before leaving their home. The quality of their answers show that they have listened ad empathised with the stories they hear. Most important for all the schools has been the opportunity to hear from and discuss with Zak his own journey. Zak has a remarkable way of connecting with the year 6 students and they really enjoy his sessions and always listen well and interact with him. He is often cheered as he leaves the school and frequently asked to stay and play football! His own way of processing the many difficulties he has experienced has been to rap about them. His lyrics are poems of amazing depth, as you’ll see below… He has been brave enough to rap for each class, growing in strength and openness each time we visit a school and pledging to return to his first British school to give this talk next year, despite his own unhappy history there – he and his sister experienced bullying and prejudice. The words of Zak’s recent rap speak for themselves. We are immensely proud to have had him support this programme. Feedback from one teacher was that this was the most valuable lesson her students had ever received. Many thanks to Teresa and Nancy for their organisation and planning and for their vision to spread cultural awareness in Tendring – where diversity is minimal. We look forward to doing more talks next year! They kicked me out of my country, sucked my blood and humiliated me. They robbed me of my simplest rights and exiled me. My loved ones phone me, but I have to lie…. I wish we could meet up! Will that day ever arrive? I am sick of lying but how can I admit that it is unlikely to see my friends again. They suffocated all hope in me, and left me heavy-hearted. My dream is to live back in my country, please take me there. My friend in Syria, I want to be where you are, even if it is in the middle of war. Listen, you want to take my place? I know you are tired of the sound of bullets. I know your head is hurting, dear one. Trust me, whether you are there or here, our dreams have been shattered. You envy me and yet I envy you. It’s tough being a refugee, to live off benefits but have no identity. I am tired of being a foreigner. Syria, I want to come back to you, no words can express my pain or heal my hurting heart. I wish I could kiss the dust on your streets, roam around your neighbourhoods and shout out loud I MISS YOU. This entry was posted in In the Community, News. Bookmark the permalink.